If you’re looking for a review of the 2014 Impala by someone who has experience with Impalas, you have come to the right place. Over the years, my wife and I have owned no less than five cars with the leaping deer on the sail panels. If you add close family members, that number easily could be dozens. Right now, my wife has a 2007 Impala, and my daily-driver is a ’96 Impala SS. So when I was given the opportunity to spend a week with an all-new 2014 Impala LTZ, I obviously jumped at the chance. The fourth Saturday of the month is always a good one for Kansas City car enthusiasts, because that’s when cars line the streets of the historic downtown Liberty square. And with perfect weather and a holiday weekend, May’s event was one of the best so far this year. If you missed it, you missed out. But we’ll do our best to give you a virtual tour. As we transition from May to June, we find ourselves with a whole bunch of great car-related activities to attend over the weekend. Sundays are usually pretty slow, but not this time. There are six events scheduled, including a Corvette show at Hendrick Chevrolet, and the Micro/Mini Car Show in Westwood. Saturday brings us the Pontiac Tribute Show, which is always a good one. There are also cruises in Spring Hill, Blue Springs, Leavenworth, and Parkville, just to name a few. Check out the entire schedule of Kansas City car shows, car cruises, and car races For May 29, 30, 31, and June 1-2, 2013 in the list below. When you tune into the 97th-Annual Indianapolis 500 this weekend, there will be one car out there that nobody can pass. I’m talking, of course, about the pace car. And for the 12th year in a row, and the 12th time in history, a Chevrolet Corvette is getting that distinctive honor. 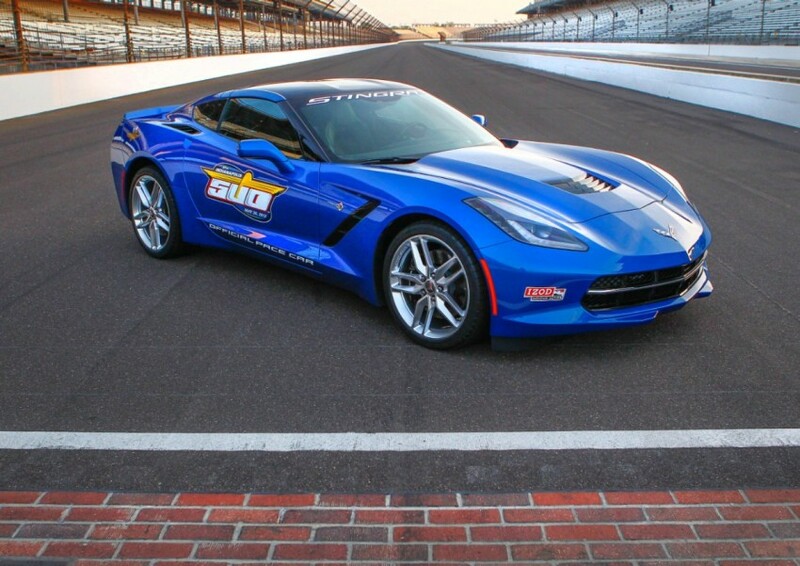 This time, it’s the 2014 Corvette Stingray. This is an all-new Corvette from the ground-up, and this will be the first time most people have ever seen one on the move. It will be painted in Laguna Blue Tintcoat, with all the requisite graphics and safety lights. Mechanically, it won’t differ from the production model, which is scheduled to arrive in showrooms this fall. The 6.2-liter, 450-hp LT1 V8 should have no trouble staying ahead of the field. Platte City has one of my favorite car cruises each month. Maybe it’s because I like Pizza Shoppe. Maybe I just think the Outta’ Control Hot Rods crew does a good job. Maybe it’s just because I like old cars wherever they are. I can’t explain it exactly, but that orange water tower seems to call my name on the third Saturday of every month. About a year ago, I had the chance to test out an early Malibu Eco, and I thought it was a pretty good car. It looked pretty good. It ran pretty good. It handled pretty good. Everything was pretty good. I thought it would be an excellent alternative for someone looking to replace their aging Camry or Accord. Many years ago, Vickie Ireland purchased a pea green ’60 Corvair sedan from the Hover Motor Company used car lot. It was all of $75, and really wasn’t much of a car. It had several problems, for which she brought it back to get help. One time, the steering wheel came off in her hand while she was driving it to lunch. Young Jim Hover took a shining to the girl, and began leaving notes on the windshield of the Corvair as it was parked around Manitou Springs. Eventually, Jim and Vickie would get married and have two kids—a result that I’m especially pleased with, because I was one of them. We’re heading into Memorial Day Weekend, so either you’ll be itching to find a car event to go to, or you’ll be busy traveling or having a barbecue. If you’re in the former group, we’ve got you covered, with a full list of Kansas City car shows and races. The Liberty Cruise will be Saturday night for the northerners, and the Belton Cruise will be Saturday night for the southerners. This Urban Car Show seems to be getting a lot of publicity at the Great Mall. And you can see a military vehicles display at the Liberty Memorial. The entire Kansas City car show, car cruise, and car racing schedule for May 22, 23, 24, 25, 2013 is listed below. Last month my mom was kind enough to shoot some pictures of the Bates City BBQ Cruise in Shawnee, and this month I was able to check it out myself. And I’m glad I did, because I was able to see some nice cars that I normally don’t see at my usual car cruise stops. My dad and I were on a citywide car show tour Saturday, and this one’s in dad’s neighborhood, making it a logical stop along the way. Dad: What the hell is that supposed to be? Dad: I mean, what is it? Me: I think it used to be a Plymouth. Dad: I’ll give ‘em one thing, they are creative. Dad: I’d be scared to death to ride in the damn thing, though. One of the nicer cruises in the Kansas City area is the Basehor Boys Cruise at the Basehor Sonic, which is held on the second Friday of each month. I hadn’t been able to get there yet this year for one reason or another, but I was finally able to break away last week to check out some of the great cars on display. Combine all that with nice people, nearby food, and a little music, and you have one of those events that should be on everyone’s list. Back in 2010, I was present for the reveal of the Cadillac XTS Concept at the North American International Auto Show. At the time, I thought it was the prettiest Cadillac I had seen in the past 15 years. But I never really expected the eventual production version to look as nice, or have such beautiful appointments. Cadillac recently loaned me the keys to a genuine, road-going 2013 XTS Platinum AWD for a week, and I’m here to tell you, it is just as impressive as the concept. Lots of great car stuff to do once again this weekend in Kansas City! The Basehor Boys are doing their Ice-Breaker Car Show on Saturday, which is something they want to build up to be like Ol’ Marais someday. The Basehor City Park is a very nice venue, so you really should give it a shot. The Platte City Cruise is Saturday night, along with several others if you’re not in the Northland. And the ASRA is hosting a big street rod convention all weekend in Sugar Creek. This is also a big weekend for racing. The NHRA Kansas Nationals is at Heartland Park Topeka all weekend, and if you’ve never experienced one of these events, it will blow you away. There are also several local circle tracks doing their thing all over the area. The complete Kansas City car show, car cruise, and car racing schedule for May 15, 16, 17, 18, and 19 is listed below. Six years ago, the Nebraska Furniture Mart in Kansas City, Kan., had a small car show, mostly for employees, out behind the loading dock. Today, the car show is much bigger. It isn’t just for employees anymore, and a nice variety of cars and trucks makes it out to this charity event for Camp Quality. This was a great weekend for it, because comfortable temperatures (along with 427-mph winds) made this a nice place to spend an afternoon. Car shows are great, but do you ever wonder where people get all those old cars? Sometimes they pick them up at a classic car auction, like the Corvette and Specialty Car Sale that was recently held at the Adesa Kansas City Auction in Belton, Mo. Normally, this sprawling facility is used to sell late model factory and rental cars to dealers, but once or twice a year they open it up to this exciting event. All’s I can say is that I hope the weather this weekend is better than last weekend, because we are jam-packed full of car events in Kansas City. This makes sense, because it’s Mother’s Day weekend, and moms love car stuff. 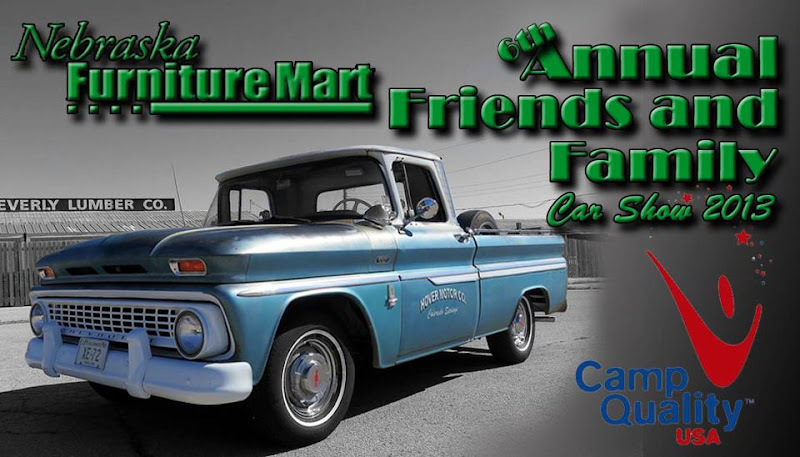 I’m planning to be at the Nebraska Furniture Mart Friends and Family Car Show on Saturday, because hey, my old truck was somehow printed on the dash plaques and trophies. I can hardly miss out on an honor like that! The Basehor Cruise is always a nice place to go on a Friday night. There’s a AAA Insurance office up north that’s doing an all-domestic car show. And there are cruises all over the place. Also, if you’re a CARB member, you can get into Lakeside Speedway for free on Friday night. The full schedule of Kansas City-area car shows, cruises, and races for May 8, 9, 10, 11, 12 is listed below. The weather this weekend left something to be desired, but there were still some car gatherings around if you knew where to look. Take the KCCA Corvette Show at Hendrick Chevrolet in Merriam. Yes, it was a little cool. Yes, it was overcast and damp. But that didn’t stop dozens of Corvette owners from attending this benefit for Camp Quality. The Liberty Cruise is normally one of the bigger ones each month, so you might have thought that the 2013 kickoff would be a barn-burner. Unfortunately, most of the day was cool, clammy, and rainy, which had an adverse effect on the cruise. But even though the turnout was lighter than normal, there were still some nice cars and trucks that decided to go for it.